Make your next purchase smarter. Steelcase Leap vs Steelcase Think – Which Chair is Better? 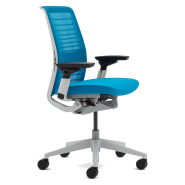 Steelcase makes some great chairs, the Steelcase Leap and Steelcase Think are two chairs that they make that are very similar but also different. However, it’s not entirely clear how the chairs are different on Steelcase’s website or through their documentation. So which is the better chair, and why? Sure we could go over every single detail in a long drawn out process, or we could just make an easy to read table so you can quickly see the differences–so that’s what we did! Steelcase Description	 "Its back moves as your back moves, its arms move as your arms move. 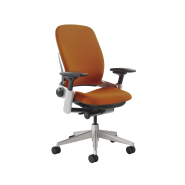 With exceptional comfort and support, Leap provides a healthier way to sit." "The Think office chair intuitively responds to the movement of the body to provide comfort. Fully redesigned, Think is smart, simple and sustainable." Differences between Steelcase Leap and Steelcase Think? So as you can see from the table, the main differences between the Leap and the Think are the adjustability of the back, as well as the materials used. The Think has mesh as an option, whereas the Leap does not. However, the bigger difference between the two chairs is how the Leap uses a glide system whereas the Think just uses one knob to control how the seat reclines. With the Think, you use one knob and it has 3 positions that lock at a spot. The third recline spot is free form with a small pushback force, and the last one doesn’t have any lock. Due to this, some people have found that the Think isn’t as comfortable to recline in. The Leap is different than the Think since the recline ability is controlled by the back tension knob but you can also control the lock of the chair with another knob. Whereas the Think combines them into one knob and makes the control a bit more intuitive, the Leap’s method of controlling the back tension and ability to recline is more advanced and customizable since it has two knobs. With the Leap, you can find just the right adjustment for you whether you want a lot of force exerted when you lean back to support you, or if you just want to lock in one positon. The think doesn’t have that good of “push back” when you lean back, and you might find that your back gets tired in the positions available. It also restricts your movement a bit more. Are you a Steelcase Leap or Steelcase Think fan? Check out our Steelcase Leap Review to see our full thoughts on the chair! Tom Spark is a chair researcher, VPN expert, and a geek product extraordinaire. When he’s not spell checking his articles with Grammarly, he’s playing video games, watching too much Netflix, and deciding if he likes his current chair or not. Check out our VPN Channel! ReviewNetwork.com is affiliated with web hosts, Amazon.com, and other affiliate programs listed on this site.